Adriano has an impressive list of achievements with among others, placings at the Swedish Young Horse Championships as a 4-5-and 6-yr old. He was selected to represent SWB at the World Breeding Young Horse Championships as a 5-yr old under Pernilla André. He has continued his success since being imported to the United States in 2015 and is currently training Prix St. George. 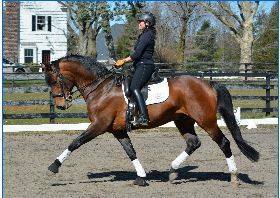 Adriano is a powerful mover with a breathtaking canter. He has a natural ability for passage and piaffe. Adriano received 8,8,8,8,8,8 = 48p and overall second at the regional foal championships in 2008 and qualified for the national championships. Diploma in gaits at the three year old test 8,8,7,8,8,8 = 47p (shared 4th to 51st) at Strömsholm. Participated in the 70d test in Schlickeau, Germany in 2011 with 7.61 in the gaits. Won in the quality of the gait of the horses in Sundsvall 2012 with 7,8,9,9 on the gaits. Diploma and qualified for the Swedish Breeding & Sports Championship at Flyinge. 7th place in the final. His sister Athena (SWB) born 2013 by Tailormade Temptation won the 5-year old Swedish young horse championships, Breeders Trophy in 2018 and represented SWB in the WBFSH World Young Horse Championships in dressage in Ermelo 2018. 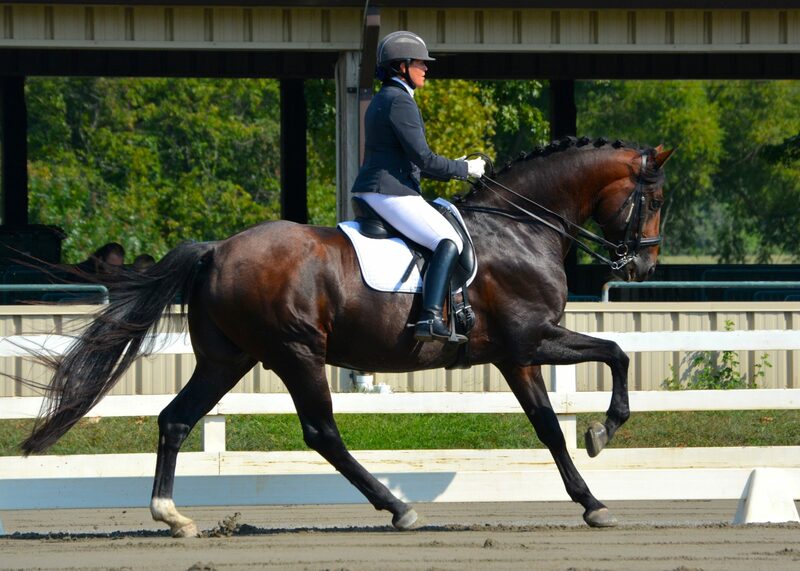 His dam Mint was a very successful dressage horse at FEI level before retiring into breeding, passing her unusual talent for piaffe and passage on to her offspring. His sire Don Primero has been the world’s leading dressage sire for four consecutive years, and earned an incredible 194 index in 2003. In 1990, Don Primero won the German Dressage Horse Championships in Verden, under Heiko Munzmaier, emulating his illustrious sire, Donnerhall. He has also won in-hand and jumping classes. His offspring excel in dressage, but also compete well in advanced showjumping, driving and eventing. Don Primero has several licensed sons and has sired offspring of the highest class with many premium foals and many of his offspring competing and winning in the FEI levels.